Mimi’s Café menu prices for a French-inspired restaurant chain offering breakfast, lunch, and dinner. Mimi’s stays true to its French roots by sourcing ingredients from France and making their sauces from scratch in small batches. The diner specializes in French food and is highly regarded for its French themes, décor and menu items. It also offers American food classics. Below are the latest Mimi’s Café menu prices. To get the latest news, offers, and promotions, guests can sign-up to join Mimi’s e-club and receive regular emails. For signing up, new members will receive a free 2-pack of croissants or muffins. The company is currently based in Irvine, California, although it is planning to relocate to Dallas, Texas. The chain itself was founded in 1978 by Arthur J. Simms, his son Tom, Paul Kurz and Brian Taylor. 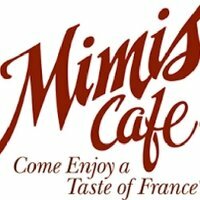 Simms, the former head of MGM Studios’ commissary back in the 1950s, believed that a French American restaurant would appeal to the public, and the first Mimi’s Café was opened in December 1978 in Anaheim, California. Today, Mimi’s Café has locations in 24 states. The company expanded rapidly, and in 2004 it was purchased by Bob Evans for USD$182 million. In 2013, Mimi’s Café was sold to Groupe Le Duff, which also runs the La Madeleine restaurants. Despite the changes in ownership, the restaurant continues to serve guests with classic French and American dishes. Among the most popular items on the menu are the Cinnamon Roll French Toast, Andouille Sausage & Red Pepper omelets, Grilled Chicken Sandwiches. They also have Just-Baked Croissants and muffins as well as a wide selection of American and French desserts. Mimi’s can also cater special events and provides a to-go menu for people with limited time to dine in. For more information about Mimi’s Café, please visit their official website.